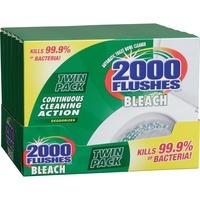 Automatic toilet bowl cleaner features the power of bleach to kill 99.9 percent of bacteria without scrubbing. With the addition of chlorine, this bowl cleaner quickly washes away stains and keeps your water crystal clear with every flush. Long lasting formula continuously cleans to keep your toilet bowl fresh for up to four months. Toilet bowl cleaner is perfect for keeping bowls stain free, sanitary and deodorized.